Town won 2-1 in Cumbria last Saturday and Powell said after training on Tuesday: “What a difference a week makes, after an embarrassing performance on New Year’s Day at Tadcaster. Town are 13 places behind Hyde in Division One North, in spite of climbing four places with last Saturday’s success. Powell said Hyde were having a fantastic season and his men would have to raise their game. Hyde, who beat Town 5-1 at Ewen Fields on October 21, a week before they entertained MK Dons in the first round proper of the FA Cup on BBC2, are on a seven match unbeaten run under ex-FC Halifax Town manager Darren Kelly. With striker Gabriel Johnson suspended for three games, Powell brought in journeyman Waide Fairhurst, who will add experience and quality. Goalkeeper Laurence Bilboe had gone back to Rotherham. Striker Aaron Martin (ankle) is having a fitness test. BRIGHOUSE Town Ladies will make a second attempt to play their FA Cup third round tie away to Derby County at Mickleover Sports on Sunday (1.0). The match was postponed last weekend and boss Rob Mitchell believes that could work in Brighouse’s favour as Charlotte Proud and Becky Kendell are now available. Brighouse blew away the cobwebs with a 5-0 win at Barnsley last midweek. Should Town win on Sunday, they will have a glamour tie away at Women’s Super League side Sunderland, currently fifth in England’s top division. HUDDERSFIELD Amateur FC entertain bottom of the table Sherburn White Rose in the league on Saturday. The reserves are in League Trophy action at Field, the thirds are at home to Tyersal and the fourths travel to top of the league Norristhorpe. 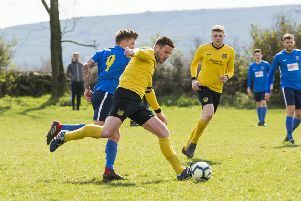 OVENDEN West Riding hope to get back into West Riding CA League action on Saturday when they visit inconsistent West Horton at Bradford University (2.0). West Horton caused a major surprise in October by knocking West Riding out of the league cup by 5-4 but since then their form has nosedived. They should be a force to be reckoned with on their 4G pitch. Steve Fullard is expected to have recovered from a thigh injury.